This fairy-tale jackpot slot is extremely popular amongst fans of Cindereela, Hold Your Horses and Jackpot Crown. Its colourful, lucrative and full of wonderful treasure! It offers players an entertaining game which is full of free spins, spin games and a massive, progressive jackpot! It has 5 reels and 20 paylines and is a great slot for any beginner or well-seasoned slots player looking for something fun and not too basic but also not too over-complicated! Just like with the majority of other NovomaticCasino.co.uk games, you can play King’s Treasure for free until you feel like you’re ready to play with and win real money! You’ll always be able to see your balance at the bottom of the screen to the left; your last win on the right and your bet amount in the middle. You can increase or decrease your bet amount whenever you want to by using the plus and minus symbols to change how much you’d like to bet on each winline and remember: the bigger your bet, the bigger the jackpot! You’ll be able to see the amount of the jackpot at the top right-hand side of the screen and watch it get bigger each time you spin! You’ll also be able to check the paytable to see how much each winning combination of symbols will pay out according to your current bet. The aim of the game is to spin three or more matching symbols (except the Wild which pays out from 2) in a winline, on consecutive reels from the left to the right. The more matching symbols you spin, the bigger the payout! The card values pay out up to 7.5 x your bet and the prince, princess, castle and chalice pay out up to 10 x your bet + spin games! These spin games are played on a separate wheel which you need to spin in order to get payouts or more spin games! The Scatter symbol in King’s Treasure is the red and gold bejewelled crown and this pays out wherever it lands! The Scatter also gives out up to 30 free spins! If you spin three or more Scatter symbols, you’ll be given a number of free spins, and during these free spins, the crown symbol then substitutes for all symbols too. You can win more free spins during these free spins and you’re also more likely to win spin games! In King’s Treasure, the highest-paying symbol is the King himself, who pays up to 50 x your bet and also gives you spin games! The King is also the Wild symbol which means that during normal play and during free spins, he can substitute for all symbols except the Scatter. What’s more, it’s the King who’ll help you get the game’s progressive jackpot! 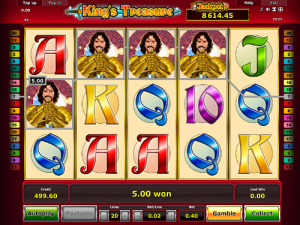 All you have to do is spin 5 of him on a winning payline and the King’s Treasure progressive jackpot will be all yours! Here at NovomaticCasino.co.uk, we also have several other jackpot slots, including: Arabian Nights, Jolly Fruits, Garden of Riches, Mega Joker and Rings of Fortune – and some of these offer life-changing amounts of money! Additionally, we have a generous selection of table games and live dealer games which are fantastic for high-rollers and those of you who want to experience the real casino vibe but from the comfort of your own home. Choose from games such as: Baccarat, Royall Crown Blackjack, Multiball Roulette, Sic Bo, Poker, Live Baccarat, Live Blackjack, Live Roulette and Live Poker.